Surprise and amaze her with this stunning diamond solitaire ring in luxurious platinum, crafted with a secret diamond in the band and a 1 carat total diamond weight. The Forever Diamond has a unique flower cut made up of 73 facets, the result is exceptional radiance. Each Forever Diamond has been independently certified by the GSI for colour, clarity, carat and cut. It's your guarantee of quality and beauty. 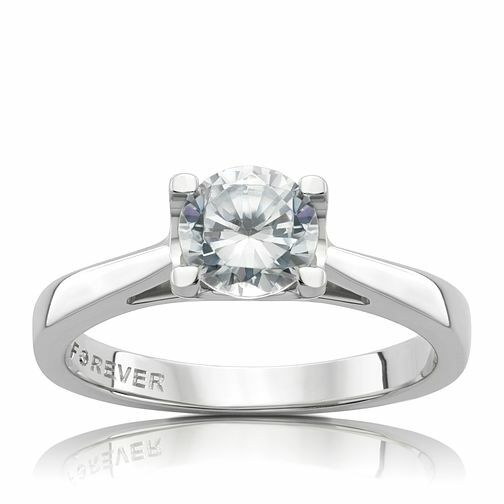 Platinum 1 Carat Forever Diamond Ring is rated 5.0 out of 5 by 4. Rated 5 out of 5 by Anonymous from Ring with brilliance Beautiful and sparkling diamond ring, am really happy with it.